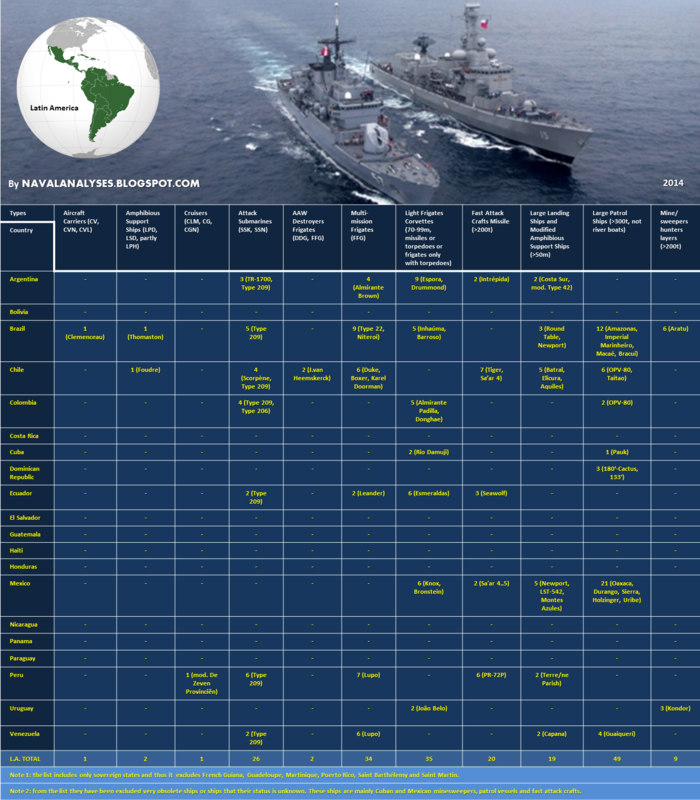 The following image depicts the most important naval forces by each sovereign state of Latin America region. Similarly with my previous Naval Forces posts, I include also the classes and not just quantities. Therefore, I made it easier for the reader to realize where these numbers came from and the most important to check and to understand why a class belongs to a specific category of warships. Before starting completing this large table, I used almost the same criteria I used for the EU Naval Forces table that helped me to categorize better each class and to make a fair allocation of the warships that each LA country has in each type of warships. I avoided each country's system of pennant numbers such as -D- for Argentinian Almirante Brown class that allocates the class to destroyer type despite the non destroyer's capabilities and the small size of the class. I tried to avoid also the unfair categorization of warships in a higher position in the hierarchy such as the Pauk or various fast attack crafts to corvettes without having missile launch capability or their capabilities are inferior to a modern corvette respectively. I did my best to avoid all these unfair classifications and based on capabilities, size and armament I divided all the classes (in brackets) except of the auxiliary ships in eleven (11) main types/categories. 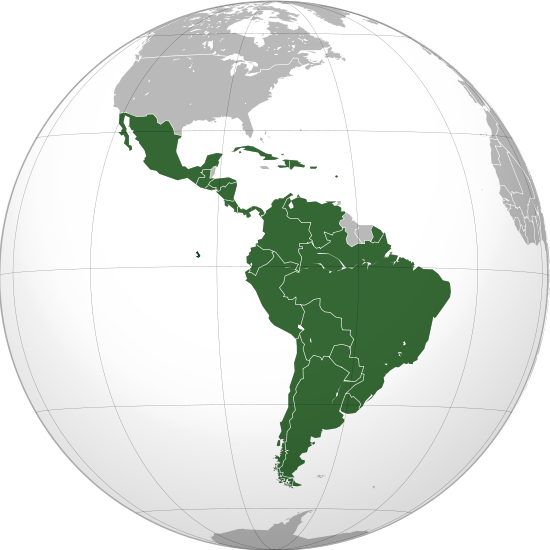 I have excluded types of warships such as Large Helicopter Carriers (LHD, LHA, LPH) and Ballistic Missile Submarines (SSBN) as there is no country operating these types in Latin America. I have added though the Cruisers (CLM, CG, CGN). Obsolete ships or ships their status is unknown, they have been excluded (mainly Mexican and Cuban ships). Aircraft Carriers: all the conventional aircraft carriers (CV), nuclear-powered aircraft carriers (CVN) and light aircraft carriers (CVL) belong to this class. Cruisers: light missile cruisers, guided-missile cruisers and nuclear powered cruisers (CG, CGN, CLM). Anti-Aircraft Warfare (AAW) Destroyers and Frigates: in this category they belong ships that have the primary mission to provide anti-aircraft protection to other ships and for this role they are equipped with launcher(s) dedicated for this role and only. Light Frigates and Corvettes: ships between 70-99m that are equipped with missile or torpedo launchers. Here also belong the Knox and Bronstein class frigates of Mexican Navy despite their length as they are armed only with torpedo-tubes. Fast Attack Crafts Missile: boats that are fast, small in size (not less though than 200t at full load) and they carry surface-to-surface missiles (SSM). Large Landing Ships and Modified Amphibious Support Ships: ships that are larger than 50m and they support amphibious operations by carrying vehicles, crafts and tanks. The category includes modified ships that operate in this role such as the ARA Hercules. Large Patrol Ships: ships that are larger than 300t in displacement at full load and they are armed mainly with guns, ships with or without helicopter deck and/or hangar and their primary mission is surveillance. River boats are excluded. Mine-sweepers/hunters/layers: ships larger than 200t with the primary role of mine sweeping, mine laying or mine hunting. 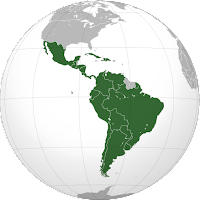 Latin America Naval Forces in 2014. For high resolution image click here.